Gavel Fell is one of the group of fells clustered around Blake Fell. It is linked to Blake Fell across the col to the north-west, but this is the only direct connection to other high ground. To the west the fell drops down into the valley of Croasdale Back. To the east the slopes drop down into Whiteoak Moss, which separated Gavel Fell from Hen Comb. In the south the decline is more gradual, and the southern end of the fell merges into Banna Fell and Floutern Cop, before reaching Floutern Pass, which separates the entire Loweswater fell system from the start of the line of major fells that sit between Ennerdale and Buttermere (Great Borne, Starling Dodd, Red Pike, High Stile, High Crag and Haystacks). The Ennerdale face of the fell is rather uninteresting - just another of the grassy lumps at the western end of the valley. The Loweswater side is far more interesting. The long heather-covered northern ridge ends at Black Crag, which overlooks the pretty High Nook Tarn. The entire High Nook valley is an attractive area, with steep rocky slopes to the south and north, and two steep mountain streams forming a frame for the less steep western slopes. The route from Croasdale is apparently no longer usable. However it is possible to reach Gavel Fell from the Leaps, not far to the north. There is plenty of roadside parking just to the north of Cauda Brow. An old mine track runs east along the southern slopes of Murton Fell and into the Forestry above Cogra Moss. This brings us to a junction where the main track continues along the slopes of Low Pen, a footpath drops down to Cogra Moss and a side track branches off to right. Turn right onto this track, then almost immediately left onto a path that runs along the fence path up Low Pen. Follow the path up to High Pen. Where the path begins to climb up Black Fell head off to the right, staying level, to cut across the top of Fothergill Head. This brings us to the next fence - turn right and follow this fence line to the top of Gavel Fell. From Maggie's Bridge in Loweswater follow the track past High Nook Farm. When this emerges onto the open fell there are two routes - either take the valley bottom path past Highnook Tarn and then up the tongue of land between Highnook Beck and a nameless beck coming down from Black Fell to reach the top of Fothergill Head, or take a track that runs off to the left and climbs over the northern ridge - the main track heads into the next valley, but as it crosses the ridge look out for a footpath that branches off to the right to run up to the summit. 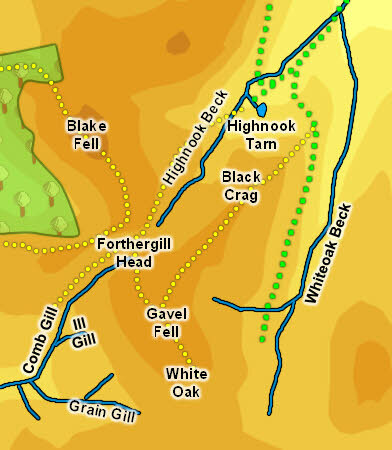 It is also possible to reach Gavel Fell by following Floutern Pass to the top (west of Floutern Cop and Floutern Tarn) and then turning north to head towards White Oak and the summit. We have an ascent of Gavel Fell from Maggie's Bridge at the eastern end of Loweswater. The top of Gavel Fell is a fairly level and grassy area that peaks close to a fence junction, and slopes gently down to the south-east towards the rocky outcrops at White Oak. This ridge is at 90 degrees to the long ridge that runs out towards Loweswater. The main fence runs along the summit ridge line, and generally follows the watershed, with the streams to its west going down towards the Ennerdale valley and those to its east heading into Loweswater. Gavel Fell has very clear boundaries, each formed by a named stream. On the Ennerdale side Comb Gill forms the western boundary and Grain Gill the southern boundary. The fell ends where these two becks merge to form Croasdale Beck. On the Loweswater side Highnook Beck runs down the western side of the northern ridge and Whiteoak Beck the eastern side. The fell ends where the two becks meet just below High Nook Farm. High Nook Tarn belongs entirely to Gavel Fell, sitting on a ledge to the east of Highnook Beck. There are some disused mining shafts and levels towards the north-eastern corner of the fell.